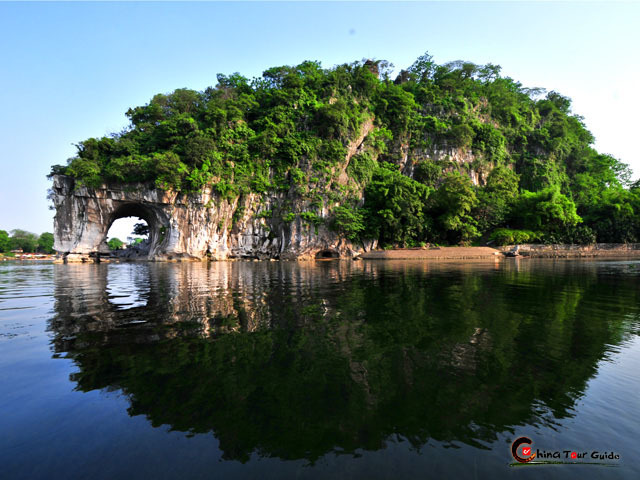 The Elephant Trunk Hill lies on the southern corner of Guilin, where the Peach Blossom River joints the Li River. 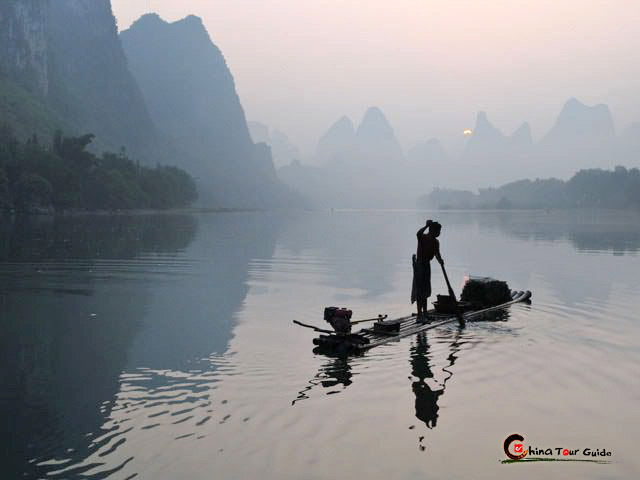 It is one of the most visited parks in Guilin and regarded as the symbol of Guilin. The hill is shaped like a huge elephant drinking water from the river, hence it is called Elephant Trunk Hill. Shui Yue Cave (Water Moon Cave) is between the trunk and the legs. The inverted reflection of the cave in water plus the part above forms a full moon, a truly unique phenomenon. Many inscriptions from the Tang and Song Dynasty can be found written on the wall inside the cave lauding the beauty of the mountain and water landscape. Visitors can boat through the cave to the river and on a moonlit night will see the moon 's aged reflection in the quietly lapping water. Another cave regarded as the eyes of the elephant lies on the hillside. With a height of around 2 meters, the cave is 5 to 10 meters wide and about 52 meters long. A look through the cave affords a good view of the surroundings. On top of the hill stands a pagoda named Puxian Pagoda. Built in the Ming dynasty (1368-1644), from a distance it looks like the handle of a sword and many beautiful legends about the pagoda are shared by the locals. There are many carvings and inscriptions inside and outside the pagoda. 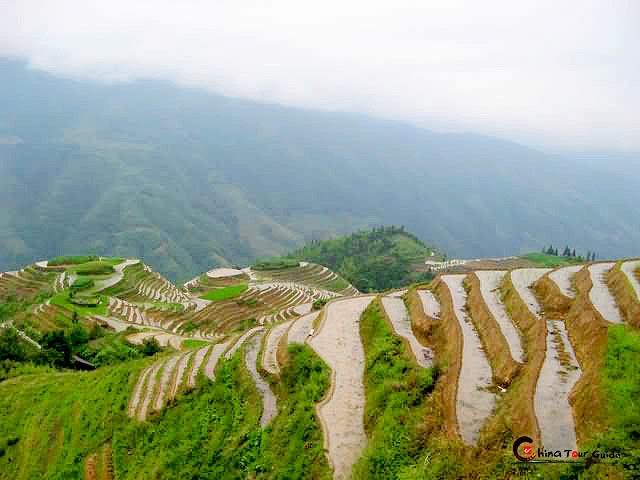 If the visiting does not satisfy your interest in the ethnic odyssey, we recommend you to travel further from Longsheng. 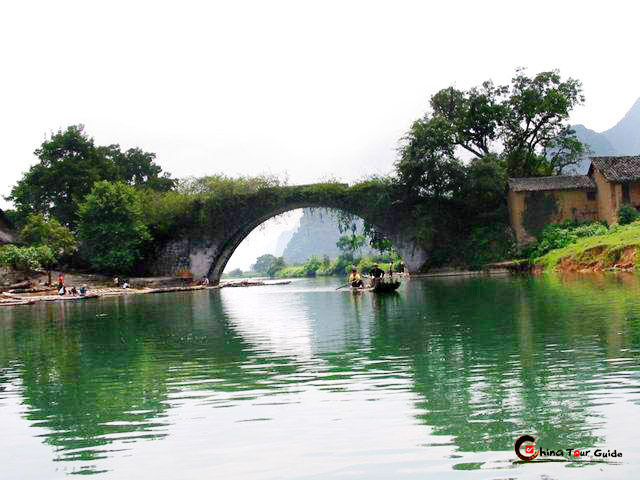 When plunging into Sanjiang, about 2-hour drive away, you will find yourself in a primitive Dong Minority community with notable Chengyang Wind and Rain bridge. 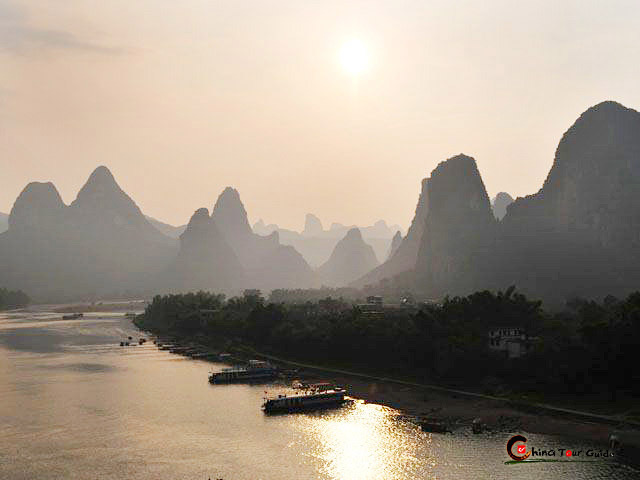 Love Island is near the hill and provides a nice place for tourists walking around to enjoy the Li River and surrounding landscape. You can drink beer, eat local rice noodles and barbecue all while sitting on a chair with your legs relaxing in the cool water. Tourists definitely don 't want to miss out on the view from the top. Stone steps have been laid as a convenient path to the top of hill where you can see the panoramic view of Guilin city and the natural scenery.